I made these one night with a friend…. Surprisingly perfect. They go really well with a nice cold beer. 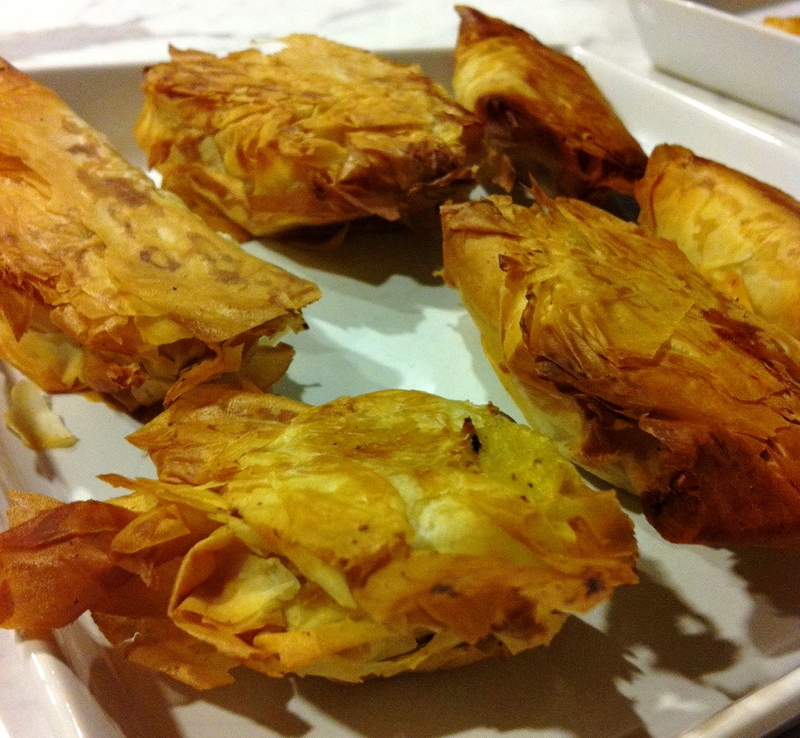 The flakiness of the phyllo contrasts nicely to the dense, moist, potato, onion and pea filling. I actually like this style of Samosa wrap a lot more than the traditional thicker fried pastry. 4 tbsp olive oil, clarified butter, or ghee. Defrost Phyllo dough by letting it sit in the bag at room temperature whilst cooking. Boil potato cubes for 5-10 minutes, or until tender. Whilst boiling potatoes, in a separate pan on low heat, toast the cumin seeds until slightly aromatic. remove and chop roughly, set aside. On medium heat, add ghee / oil to pan, add onion, curry powder, coriander, and cumin. Sauté until translucent. Add garlic, potatoes, peas, and stir to mix ingredients well. Cook for 5-10 minutes, stirring or ‘flipping’ potato mixture to ensure it does not burn (slight golden brown is ok). Taste, and season with salt, pepper and additional curry powder if needed. Add cream and stir. When potato is throughly cooked through and soft, remove from heat to a bowl and allow to cool. Cut into the layered phyllo into 4-5″ strips. When filling is cold enough to handle, place about 1/4 cup in hand and take 2 strips of phyllo to wrap around mixture. Spray layer of phyllo with pam. grab another 2 strips and wrap the opposite end you just wrapped. Again, spray with pam. pick up 2 strips and crush to crumble in bowl. Place samosa into bowl full of phyllo crumbs, allowing crumbs to stick to the pam. Stick as much on as desired. Place on greased baking sheet. Spray again with pam. Repeat until all of the filling is used. Ensure that each layer of phyllo has been sprayed or not you will get a dry chalky shell. Put in oven set at 375 F for 10-15 minutes or until uniformly golden brown. You may have to increase your oven temperature to 400 F to get the desired browning. Also, it may be easier if you don’t mind wasting some phyllo, to crush about 1/4 of the strips into a bowl to use with all the samosas to speed up the process above. This makes a great party food.